I know what you’re thinking…”but that’s not healthy!” That may be true…BUT everything in moderation is fine! Plus, I am a food lover not a fighter! I would never deprive myself of any type of food; I just won’t have it on a daily or weekly basis! Having said that, don’t be scared to try this delicious recipe I’m about to share. Share it with your family and friends if you’re worried about eating it all and consuming all the calories by yourself! Which could be done since it’s that good! 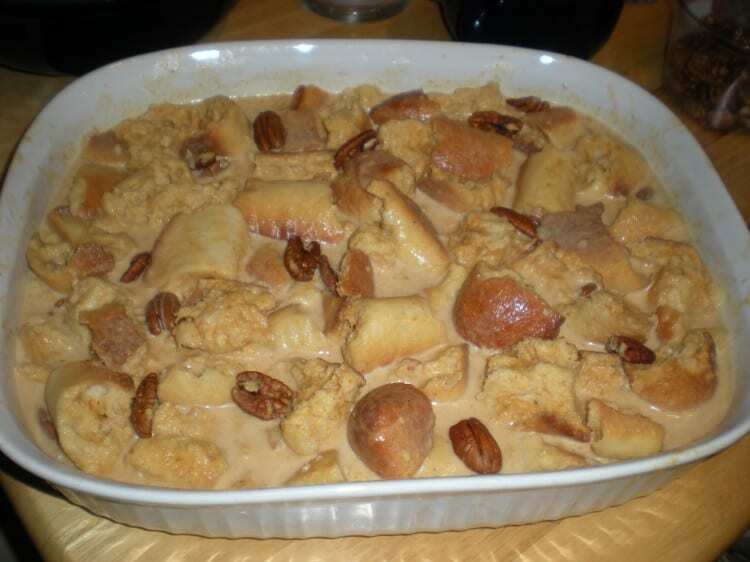 A perfect dessert to make for the holidays, it also is a great dessert to enjoy served warm in the winter time. And unfortunately, in the North East, we know winter lasts forever! 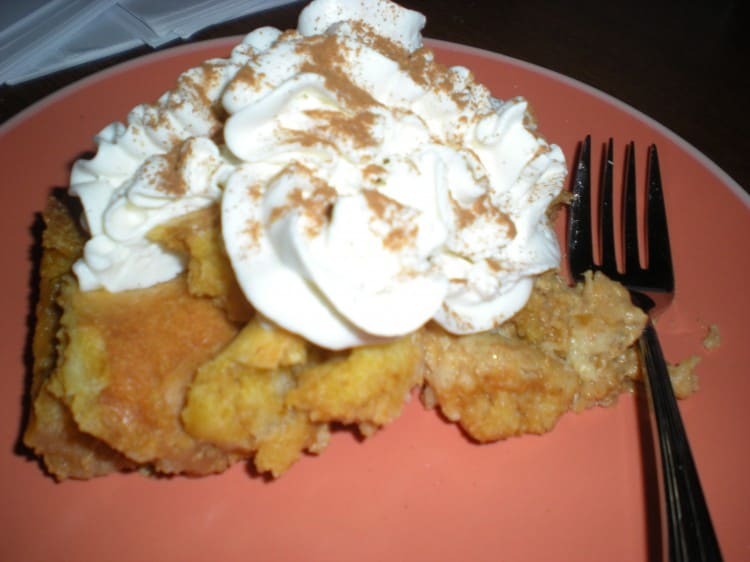 So why not put a positive spin on shoveling mass amounts of snow and treat yourself to some PUMPKIN BREAD PUDDING!!! If I still haven’t convinced you that it is OK to indulge every once in a while, then let me tell you some fun nutrition facts about pumpkin! 1 cup of pumpkin, boiled and drained, has ONLY 49 calories! 1. Preheat oven to 350 degrees F. You will need one ungreased 9 X 13 rectangular glass or ceramic baking dish. 2. Place bread in a large bowl. Pour melted butter over it, and toss. 3. In a large bowl, whisk cream, milk, eggs, sugar, salt, pumpkin pie spice, pumpkin, and maple syrup. 4. Place bread in the baking dish. Add pecans (saving a few to scatter on top). Pour pumpkin mixture over bread, and toss until well coated. Scatter remaining pecans over the top of the pudding. Bake for 25-30, or until the top is lightly browned and the custard is set. A word to the wise for those who have not yet mastered the art of bread puddings…make sure those pieces of bread are small! We’re talking seriously one inch people! I let some pieces be bigger than this and while it didn’t really alter the taste, the appearance could have used some improvement. This is why practice makes perfect! You make a recipe and take notes for the next time! So hurry and make this recipe before the flowers start blossoming! Or, save it in your recipe book for the fall! 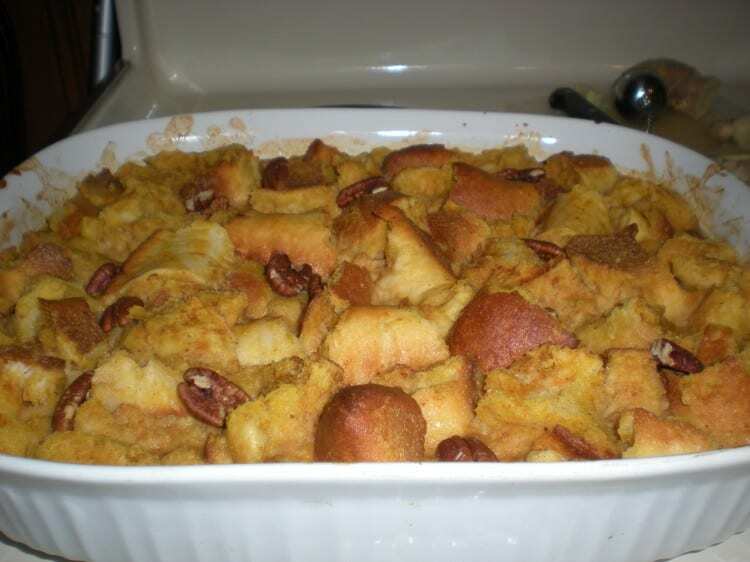 What’s your favorite type of bread pudding? !